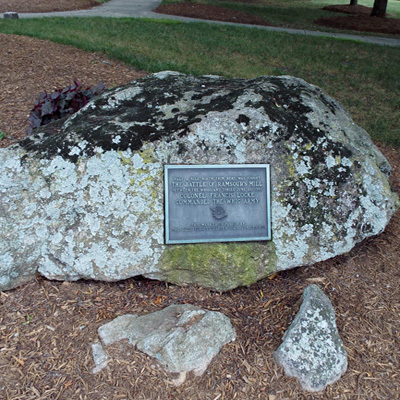 At the north end of the square, facing North Aspen Street, is a large rock with an embedded plaque honoring the Battle of Ramsour’s Mill, which was fought a half mile to the north on June 20, 1780. Exactly 150 years later, the Jacob Forney Chapter, Daughters of the American Revolution, installed the marker. Half a mile north from here was fought / The Battle of Ramsour's Mill / between the Whigs and Tories, June 20, 1780. / Colonel Francis Locke / Commanded the Whig Army / This marker is placed by / the Jacob Forney Chapter D.A.R. June 20, 1930. Nowadays, the mass grave site and the graves of several of the officers who fell in the battle have been marked through the efforts of historical groups and individuals. Marker is at the intersection of Court Square and North Aspen Street, on the left when traveling west on Court Square. It is located on the North side of the Lincoln County courthouse. The surrounding courthouse square is dotted with historic monuments, including the Lincoln County Veterans Memorial and Confederate Monument, both located at the western entrance of the building. The Lincoln County War Memorial stands at the eastern entrance of the courthouse. The monument to Admiral Rufus Z. Johnston, Medal of Honor, is located to the right of the western entrance of the Lincoln County courthouse. 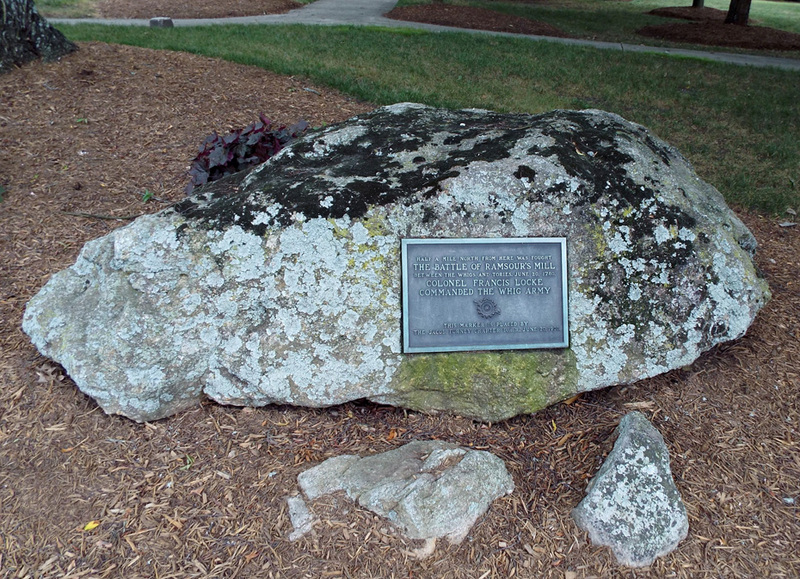 The rock with embedded plaque sits on the lawn under shady trees.